“[T]he newly amended ordinance clearly violates the constitutional rights of not only Deerfield residents, but any visitors to the community and those just passing through,” said Guns Save Life, the organization that filed the lawsuit April 5. The possession, manufacture, and sale of assault weapons in Deerfield is not reasonably necessary to protect an individual’s right of self-defense or the preservation or efficiency of a well-regulated militia. Under the law, the only people allowed to carry firearms considered “assault weapons” are the police and members of the military. Previous drafts included a self-defense exception, where a person would be innocent of violating the law if the firearm were used to lawfully defend himself or herself. That self-defense clause was removed. The ordinance defines an assault weapon as “a semiautomatic rifle that has the capacity to accept a large-capacity magazine, detachable or otherwise.” It lists common attachments such as “folding, telescoping, or thumbhole stocks” and muzzle brakes. A large-capacity magazine is defined as having the capacity to hold more than 10 rounds. But defining “assault weapon,” as media outlets as varied as The New York Times, Reason, and The Daily Wire have noted, is contentious at best, and politically charged rhetoric aimed at manipulating well-intentioned voters at worst. “The anti-gun lobby has long depended on public confusion about exactly what an ‘assault weapon’ is,” Reason, a libertarian magazine, wrote. 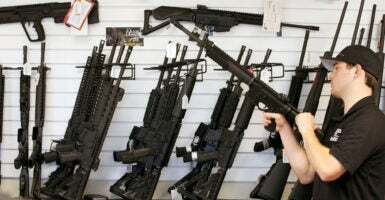 “The reality is, there’s very little difference between any sporting firearm and a so-called ‘assault weapon,’” Steven C. Howard, a lawyer and firearms expert in Lansing, Michigan, told The New York Times. The AR-15 stands as America’s favorite rifle for a number of very good reasons. People young and old can effectively utilize the AR platform for competition, recreation and self-defense. Yes, guns protect families. Guns protect children. Banning one of the most effective guns widely in use by America’s nearly 100 million gun owners will only serve to protect criminals, lunatics, and terrorists. Residents who don’t remove the newly banned weapons from village limits, turn them in to the police, or render them “permanently inoperable” by June 13, the date the ordinance is set to take effect, will face a fine of $250 to $1,000 per day. John Boch, executive director of Guns Save Life, released a statement regarding the NRA’s support. “We are going to fight this ordinance, which clearly violates our members’ constitutional rights, and with the help of the NRA, I believe we can secure a victory for law-abiding gun owners in and around Deerfield,” Boch said.